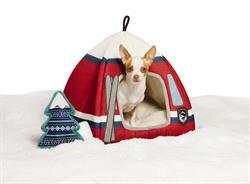 BURLINGTON, ON--(Marketwired - November 20, 2017) - PetSmart, the leading pet specialty retailer in North America, and Ellen DeGeneres, passionate pet enthusiast and product design guru, announced today the launch of the ED Ellen DeGeneres Winter Collection for pets with a fun ski theme including chic scarves, sweaters and outerwear, as well as festive toys to keep pets warm and active through the coming winter months. The ski-themed items include plush toys featuring ski goggles, St. Bernard dog, skiing bear and apparel such as the Augie ski dog hoodie featuring a dog on a pair of skis. Classic items like the red buffalo plaid scarf dog collar, festive red crew-neck sweater and shearling-lined quilted barn coat all include the scripted "Love" and "Joy" design elements, an iconic feature in many of the ED Ellen DeGeneres apparel designs. A focal item in the collection, a winter accessory set, with its coordinating leg warmers, a neck-warmer style scarf and pom-pom hat done in brown knit with pops of red -- perfect for an outdoor photo op! Winter toys include lots of animals like bears and wolves with classic fair aisle knit detailing, a knit hat flattie dog toy and a pair of knit mittens connected with a rope -- all with squeakers to engage play. "My new Winter Collection for PetSmart has something to keep all of your pets warm, stylish and active this season," said Ellen DeGeneres. "It may not stop your pets from running through the house tracking mud and snow, but my goodness, will they look great doing it." Launching Feb. 1 of this year exclusively at PetSmart stores and PetSmart.ca, the ED Ellen DeGeneres pet collection includes hundreds of evergreen products, a Cat Collection and seasonally refreshed assortments four times a year. Also included is a collection of natural at-home grooming products and tools that can be found in the problem-solution aisle at PetSmart. *Ends 12/31/17. 5 oz. dog food, 1.5 oz. cat food donated to PetSmart Charities to feed dogs and cats in need. See details at petsmart.ca/giveameal. The actual number of meals donated is based on dog and cat food bags sold. The meal donation estimate is based on historic sales for similar time periods. No guaranteed amount. PetSmart, the leading pet specialty retailer in North America, and Ellen DeGeneres, passionate pet enthusiast and product design guru, announced today the launch of the ED Ellen DeGeneres Winter Collection, a seasonally refreshed collection that is part of the comprehensive ED Ellen DeGeneres pet assortment exclusively available at PetSmart. The Winter Collection features fun ski themed items including chic scarves, sweaters and outerwear, as well as festive toys to keep pets warm and active through the coming winter months.